A canonical continuation by Sir Arthur Conan Doyle's son, Adrian Conan Doyle and John Dickson Carr. First published in 1954. I love the cover of this 1976 paperback reprint. Once again, "The game's afoot!" Sherlock Holmes and Dr. Watson embark on twelve new detective adventures that have been out of print for more than twenty years. These strange and surprising cases––only hinted at in the famous earlier chronicles––are recorded at last in full. Here is the good Watson, rushing impetuously to the aid of lovely ladies in distress. And Holmes, taking soothing pleasure from his violin while frustrating Scotland Yard's Lestrade at every encounter. These are, indeed, cases for the connoisseur. No one could have produced them with the authentic Conan Doyle flavor but Sir Arthur's son Adrian. 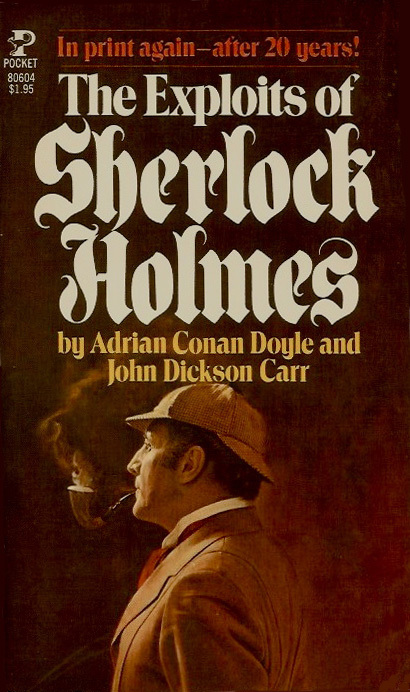 Writing with one of the world's greatest masters of mystery, John Dickson Carr, he has produced a rare casebook to delight and confound Sherlock Holmes fans the world over!